The NOAA map of 1932 does not reflect what marsh real estate had already been lost due to oil and gas operations or from the devastating effects of man-managing the Mississippi River – loss of sediment building marsh. The 2011 NOAA map does not reflect the additionally lost marshland of more than 9,000 acres – approximately a football field a day – not including today. As a redfish fishery and winged game host, Louisiana has no equal in the U. S.
Louisiana’s world-famous marshes and bountiful fishery will be gone in about 50 years. That’s not maybe. It’s already well on the way of performing a spiraling death rattle – losing land at a measured rate of 1,300 acres a year. That’s 58,500 acres since I first hunted and fished there in 1973. Why is the land disappearing at such an alarming rate? 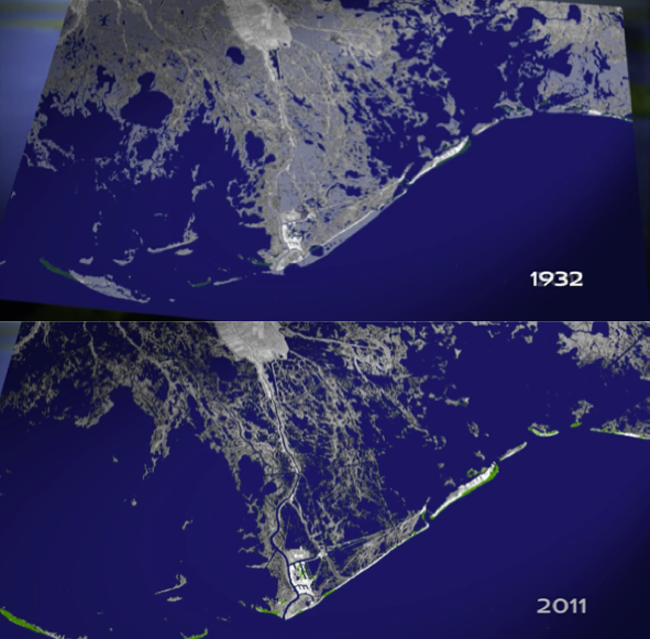 Louisiana’s coast is sinking into the Gulf of Mexico because we started managing the Mississippi River via levees in the 1800s. That began starving the marshes of naturally deposited sediments – the builder of organic materials that fed the ecosystem and made it a bountiful continuum. Also, oil and gas exploration and the canals that enterprise has built has added measurably to the decline of the Louisiana marsh Lands. Watch this Bill Rodman film and weep. For more information go to Gink & Gasoline and read Captain Lucas Bissett, a professional ORVIS endorsed fly fishing guide’s story. NOTE: Bisset is also the narrator of the Rodman film. Featured Image credit – fly fishing guide Alec Griffin with a Louisiana redfish. A commons image.